Skin Faded to a medium height, sectioned from the crown gradually leaving the weight from short to longer at the front to get your desired fullness for the bluntly chopped fringe. Then cross cutting from both sides into wet hair to get your effect. Using the hair dryer and just my hands and fingers to fully dry the hair moving from back to front pushing the hair forward to the blunt crop and adding volume in the top. Ask your barber for a Blunt Choppy Crop with mid skin fade. Tip: Ask for channel cutting to soften - avoid the thinning scissors and leaving plenty of length on the crown. 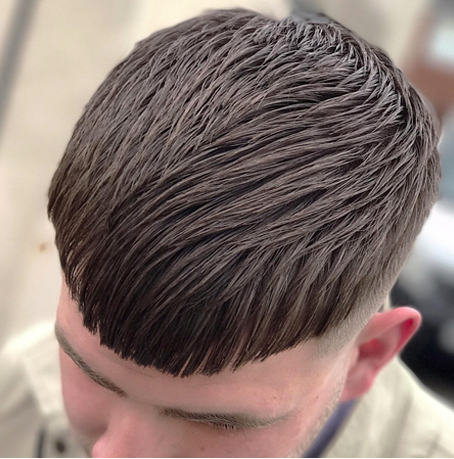 Apply Native Shaping Paste equally in to the hair and then using a streaker comb styling the hair forward in to the crop to get the style seen in the photos.